Fairdreamers, Chase & Status, Clean Bandit ft. Jess Glynne, The Saturdays, Kenny Loggins and more. 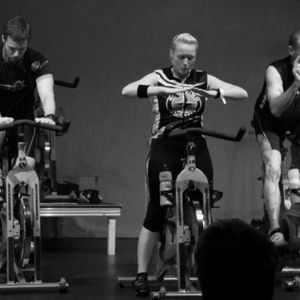 Schwinn Cycling class from Master Instructor Lou Atkinson. The goal of this class is for everyone to ride in the moment, according to how their energy levels are at that point. So, when you feel strong, take the intensity up towards 85%, when your body tells you it needs to recover, take the intensity down towards 65% until you re-energise. This also means responding to the music, so when it tells you to stand up and challenge yourself, go with it, when it tells you to calm down, listen and respond. Like any good Fartlek ride it has some surprises (don&apos;t look at the tracklist if you don&apos;t want spoilers), not least of which is Track 8. The rhythm switches between flat (100rpm) and climb (64rpm) and just over half way through, it mixes the two, so you can decide which terrain to ride.